We have a new staff member! We have added a new face to the staff at Kilgore Memorial Library. Diane will be working at the circulation desk from 11:00 am until 3:00 pm Monday through Friday. Thanks to Mother Nature this is Diane’s second day with us and she is already wandering the stacks and shelving books on her own! We are thrilled to have an extra person to help us during what is one of the most hectic times of the day at the library. Deb Robertson began leading the Kilgore Memorial Library in the fall of 2013. Prior to moving to York Deb was the Director of academic libraries in Sioux City, Iowa; Abingdon, Virginia; and Norfolk, Nebraska. She earned her Master's Degree in Library Science in 2000 from Emporia State University in Kansas. Deb and her husband Jim have two married children who live with their families in Norfolk and Omaha. 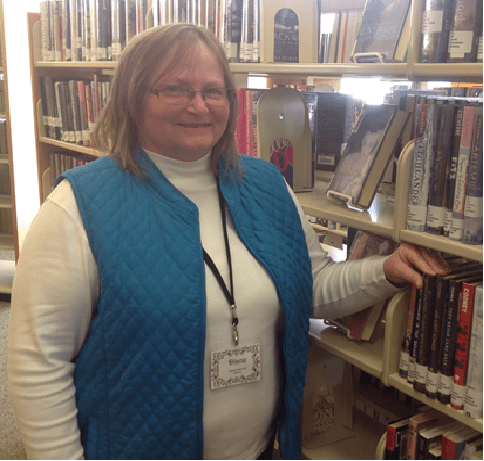 For Deb, the only thing better than working in a library is spending time with her grandchildren. « Do you have your new library card yet?